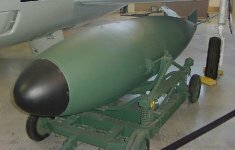 The Mark 7 "30-inch nuclear bomb" bomb was the first tactical nuclear weapon developed by the United States and the first atomic bomb to be used by all three armed services. It was deployed in more models and served for a greater length of time than any other atomic weapon in the U.S. arsenal, entering service in 1952 and withdrawing in 1967. The Mark 7, which could be carried on the outside of an airplane rather than in a bomb bay, added nuclear capability to smaller, faster fighter aircraft. The nuclear weapons programs had to keep pace with changing aircraft designs and evolving military tactics, foremost among these, the use of fighter and attack jets to carry a nuclear weapon. Initially only aircraft such as the B-29 Superfortress, the B-36 Peacemaker, and the all-jet B-47 Stratojet, could carry atomic bombs that weighed upwards of 10,000 pounds (the Mark II-IV series). The first tactical nuclear weapon was tested in May 1953. Operation Buster-Jangle tested the innovative, compact-sized Mark 7 nuclear bomb. 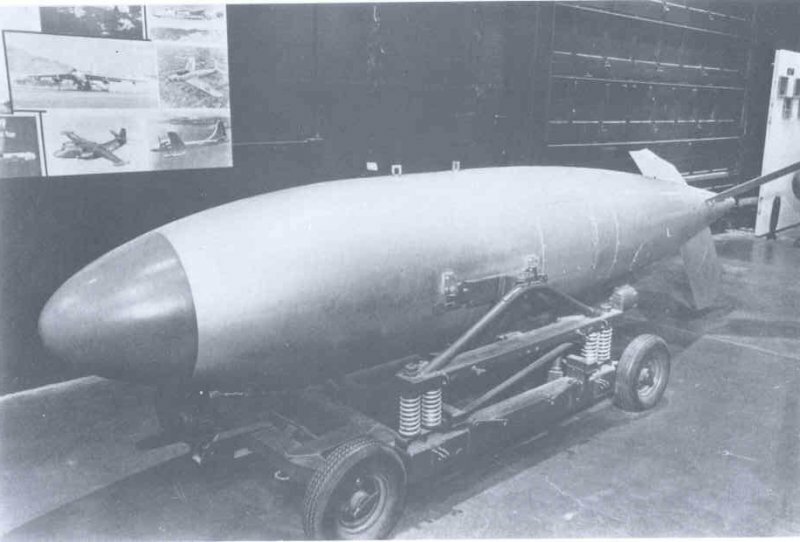 The Atomic Energy Commission (AEC) succeeded in greatly reducing the size of the bomb (the Mark 7 weighed 1,680 pounds). 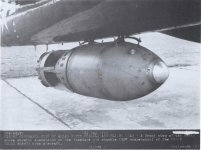 The unguided BOAR (Bureau of Ordnance Atomic Rocket) missile from a technical point of view was a tactical atomic bomb Mk.7 with a solid-propellant rocket accelerator. The need for it was due to the fact that in the first half of the 1950s. The main striking force of US aircraft carriers were piston attack planes AD "Skyraider". The slow speed of the piston machines did not allow them to make bombing with the caliber, like the F-84 and F-86 fighter-bombers. A simple unguided rocket with an atomic warhead would allow light decked aircraft to deliver nuclear strikes from a horizontal flight at low altitudes, without entering the sphere of attack of the atomic explosion and into the zone of the enemy's near-air defense. In February 1951, the Atomic Energy Commission and the US Naval Command appointed the Bureau of Ordnance as the lead developer of the missile, hence its name BOAR. The delivery of a nuclear charge of type Mk.7 or Mk.12 was the responsibility of the Los Alamos Laboratory, for the development of the hull and tail unit, the firm Douglas, the creator of Skyraider, Skyhawk and Mk.7. In the design process, four variants of the BOAR rocket were considered: supersonic with W-12, supersonic with W-12, supersonic with W-7 and subsonic with W-7. In the summer of 1952, the latest version was adopted for further development, which was given the official designation 30 , 5-inch rocket Mk.1 Mod.0. In 1953, the air defense command (Air Defense Command) became interested in an aerial missile with an atomic warhead. This weapon (as it seemed at the time) could be quite effective against enemy bombers, for which it was only necessary to refine the detonation system for operation at high altitudes (the bomb automatic Mk.7 and Mk.12 operated at altitudes of not more than 4600 m). Subsequently, the BOAR missile was considered too heavy for air-to-air weapons, but the air defense command did not abandon the idea of destroying an air enemy with nuclear explosions over its territory. The nuclear warheads were equipped with the AIR-2 Genie and AIM-26A Falcon rockets. The first BOAR Mk.1 Mod.0 missiles were delivered to the carrier aviation in 1956. The assembly was conducted by the Century Engineering plant in Santo Ann, California. A total of about 225 missiles were manufactured. The rocket body had a diameter of 775 mm and a length of 4650 mm, with the first 2600 mm being the same as the coke from the Mk.7 bomb. The tail plumage consisted of four planes, made using a new technology from honeycomb panels. With the suspension under the aircraft, the lower two planes were displaced to the electric motors in a position close to the horizontal one. The internal layout of the missile differed from Mk.7 due to the presence of an engine and other composition of the detonation system. In the bow before the nuclear charge, instead of radio altimeters, four shock fuses and a mechanism for automated installation of the uranium core were installed, behind the charge - blasting automatics and timers. The 92-lens implosive charge W-7 had a TNT equivalent of 10 to 70 kt. The total mass of the BOAR missile was 1225 kg (for the Mk.7 bomb 750-770 kg). More than half the length of the body was occupied by solid propellant engine, designed specifically for the BOAR rocket. The engine started after 0.5 seconds after the reset and developed a thrust of 6800 kgf for 3 seconds. At the end of the active section of the trajectory, the rocket developed a speed of 215 m / s. The range of flight was relatively small - from 9 to 12 km, but sufficient for the above purposes. 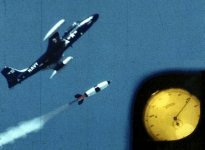 The nuclear charge detonation system, unlike the Mk.7 bomb, did not have a radio altimeter useless with a flat trajectory of the rocket. The explosion occurred at the signal from a timer or impact fuse. a flight with the inclusion of a solid-propellant rocket, an air explosion following a signal from a timer triggered when the LABS system was switched on and the beginning of the maneuvering of the cab. In the last two modes, shock fuzes served as a reserve but a case of failure of automatic detonation. The BOAR rocket could be carried on all Navy deck aircraft and F-84E fighter-bombers, but its main carrier was the Douglas AD "Skyraider" deck attack aircraft. The altitude of the flight was allowed up to 10700 m, while the pressure of 4600 m was maintained in the nuclear charge with the help of an electric compressor. It was assumed that the BOAR missiles will remain short-lived, until the arrival of the JetDisk jet attack aircraft with a LABS system optimized for a bomb Mk.7. However, the piston "Skayreydery" flew for a long time, until 1966, and even managed to take part in the Vietnam War. Accordingly, the BOAR missiles were also in service until 1963. 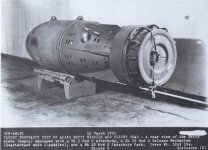 Like the Mark 6 and many other nuclear devices of the time, the Mark 7 was a capsule bomb, carrying its fissionable elements in a separate container which was inserted just prior to weapon delivery. The Mark 7 tactical nuclear weapon used a new delivery method, the Low Altitude Bombing System (LABS). With LABS, a tactical aircraft flies toward an "initial point," then commences a "4G" climb, and releases the bomb at a designated point in the climb. By the time the bomb detonates, the aircraft is a safe distance away. With its retractable stabilizer fins, the Mark 7 could be carried by a wide variety of strike aircraft. The bomb could also be fused for either air or ground burst. USAF aircraft that carried the Mark 7 were the B-45, B-57, F-84, F-100, and F-101. The U.S. Navy also carried the bomb on its A-1, A-3, F2H, F3H-2N, and FJ-4B aircraft. In a Meeting of the National Security Council, Washington, May 27, 1957, Secretary of State John Foster Dulles said that he believed he accepted as fully as anyone present, and certainly more fully than any of his State Department colleagues, the inevitability of the general use of nuclear military power as conventional. As new sources of power have been developed historically, there were inevitably great difficulties of adjusting to them; but nevertheless one had in the last analysis to be realistic and to make the adjustment. In the first place, in point of fact, Dulles said the United States did not now possess any nuclear weapons which are really limited in scope and power. Our so-called “little bang weapons” are actually of the type which produced such sensational results at Hiroshima. Thus, whether we have yet reached a point where we could wage a limited war with this kind of nuclear weapons, is very doubtful indeed. Secondly, the concept of selectivity simply cannot be disregarded, and the apparent proposal to do so would run counter to public opinion as it has come down through the ages. The time will undoubtedly come when atomic weapons will be so varied and so selective that the US can make use of them without involving widespread devastation, but that time is not yet. Secretary Dulles stressed that he did not believe that we were yet ready and prepared to exercise a selective nuclear capability. If he were wrong, and the US already did possess this selective nuclear capability, it was certainly something that the National Security Council should know about. At this point Admiral Lewis Strauss [chair of the Atomic Energy Commission] interrupted, and asked if he could point out that nuclear weapons were now being developed which were approximately 10%, or even 5%, of the size of the weapon used at Nagasaki. Admittedly, however, these small weapons were in comparatively limited quantity at the present time. They were expensive, but the number of them could be increased if this were directed by authority. Secretary Dulles went on to say that if in fact we did now have sufficient nuclear weapons to permit the US to use them and at the same time confine the effects to local theatres of operations, it was extremely important that the US Government should know this fact. Admiral Strauss indicated that this was a recent development. Secretary Dulles continued, pointing out that even if the US now had this capability (and he had not known it), American allies certainly did not realize that the US possessed such a capability. Accordingly, the US must convince the allies that the US had this capability and that these weapons can be used in such a way as to avoid the entire devastation of vast areas. Secretary Dulles said he was convinced that world opinion was not yet ready to accept the general use of nuclear weapons in local conflicts. If the US resorted to such a use of nuclear weapons The US will, in the eyes of the world, be cast as a ruthless military power, as was Germany earlier. 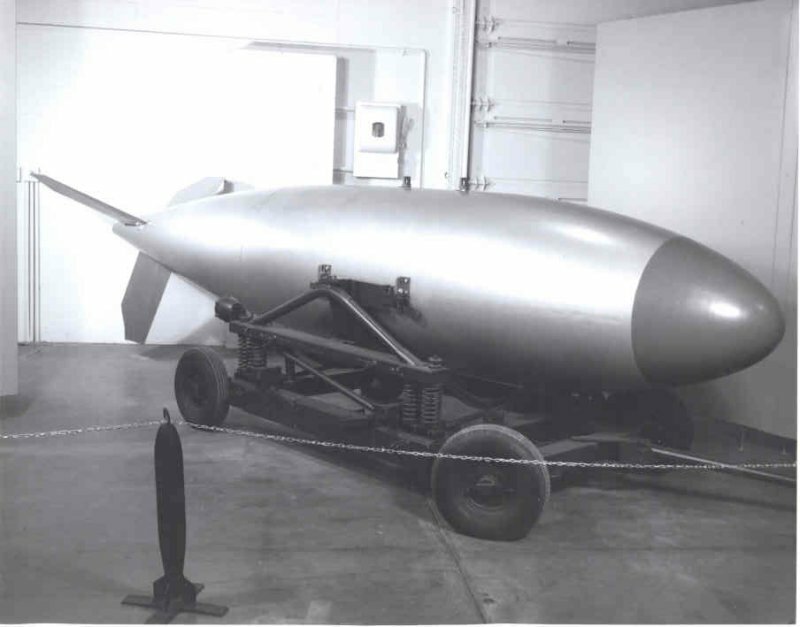 The nuclear charge W-7 was used not only in the bomb Mk.7, but also in the first atomic depth bomb Mk.90 "Betty". By the end of the Second World War, anti-submarine aircraft literally drove submarines under the water, but with the advent of nuclear powered boats (1954 - in the US, 1958 - in the USSR), fighting with them again turned into a serious problem. The high speed of the underwater passage allowed the nuclear submarine to escape from the attack between the time it was discovered and the beginning of the bombing with depth charges. In the early 1950s, during the period of universal entrainment of the military with the capabilities of nuclear weapons, the atomic depth bomb seemed to be the best solution to the problem. Tests of 1946 but at the Bikini Atoll showed that a shock wave of an underwater nuclear explosion with a capacity of about 20 kilotons destroyed the rugged hull of the submarine, even at a distance of several hundred meters. At the same time, the use of atomic depth bombs is associated with serious problems. First: because of the large radius of the submarine nuclear explosion, the application of free-fall deep-sea bombs is possible only from aircraft, but not from ships. The second: radioactive contamination, which lasts for a long time after the explosion, is dangerous for surface ships. The third: the breach, due to the explosion, the hydrology of the sea blinds the hydroacoustic instruments of the ships of the submarine for a long time, reaching several hours. But the most important problem lies in the very use of nuclear weapons to solve such a narrow tactical task as the destruction of a submarine. Unlike other types of nuclear weapons, even tactical ones, the atomic depth bomb is precisely a weapon, but in no way a deterrent to the probable enemy. In the armed forces of all nuclear powers, the decision to use atomic weapons is taken at the highest military-political level. In these conditions, the fleet, which built its anti-submarine defense on nuclear weapons, while its use is not sanctioned, runs the risk of remaining unarmed. If, however, to delegate the right to use nuclear weapons to a lower level, for example, fleet commanders or ship formations, this could lead to a dangerous lowering of the threshold for the onset of nuclear war. Therefore, currently in the fleets of all nuclear powers, atomic depth charges have been replaced with precision-guided weapons. However, the realization of these problems came later, after the Caribbean crisis, but in the 1950s the nuclear depth bomb was considered the best way to combat nuclear submarines. Preliminary studies of the use of nuclear weapons in antisubmarine defense have been carried out since 1950 by the Massachusetts Institute of Technology (MIT). 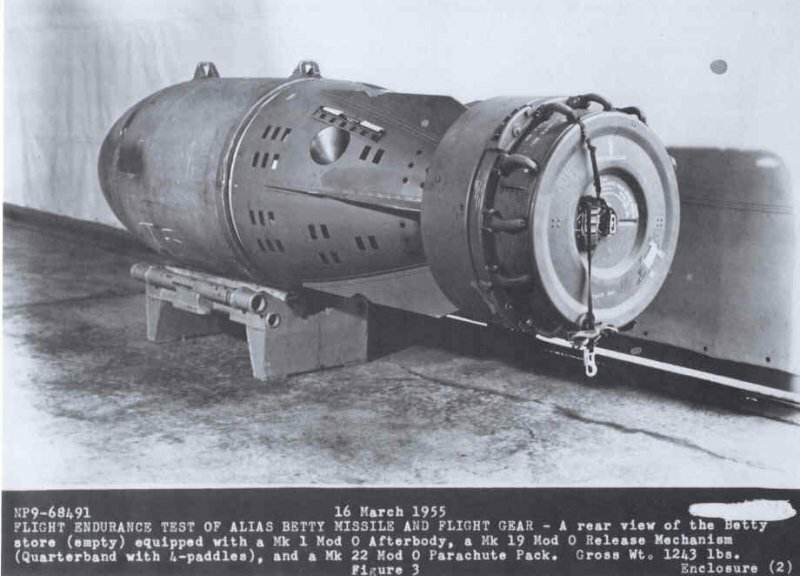 It was found that the best-possible weapon was a low-power atomic depth bomb exploded by a hydrostatic detonator at a fixed depth of about 300 m. On April 14, 1952, the development of such a bomb was assigned to the Los Alamos Laboratory (W-7 nuclear charge) and the Military Laboratory -Maritime weapons in Silver Springs, Maryland (rugged bomb building and blasting system). 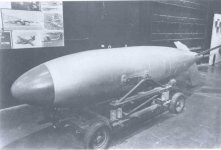 Serial production of the world's first atomic depth bomb, which received the designation Mk.90 Betty, began already in June 1955. A total of about 225 such bombs were produced. 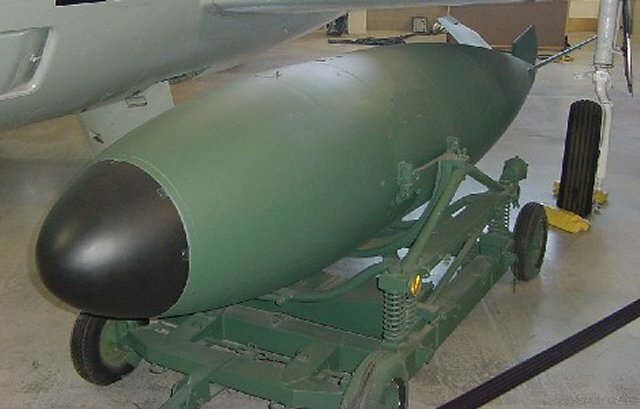 The structure of the bomb Mk.90 included: the body of Mk.1 Mod.0, the nuclear charge Mk.7 Mod.1, the suspension device Mk.19 Mod.0 and the parachute system Mk.22 Mod.0. The total mass of the bomb was 1120-1140 kg, including 565 kg - the mass of a strong steel hull and hydrodynamic tail. The case had a length of 3175 mm and a diameter of 795 mm. A parachute with a diameter of 5 m ensured a smooth landing of the bomb immediately below the discharge point. The latter requirement results from the behavior of the carrier aircraft but the detected submarine. The carriers of the Mk.90 atomic depth bomb were the Grumman S2F deck anti-submarine aircraft "Tracker" and the flying boat Martin R5M "Merlin". In addition, during the testing period, it was suspended under the Grumman F7F-3 twin-engine multi-engine "Tigerkat". The 30.5-Inch BOAR (Bureau of Ordnance Atomic Rocket or Bombardment Aircraft Rocket), one of the earliest rockets designed to carry a nuclear warhead, was a tactical standoff weapon in service 1956-63; a bombing technique and release computer (the forerunner of the CP-741) were also developed at China Lake. The Warhead Mk 7 was used in the Mk 90 Alias Betty, an ASW depth charge for the S2 and P5. The Mark 7 was the warhead on the Army Corporal and Honest John short- range ballistic missiles.